Galaxy is a science fiction combat card game for two-to-five players (the more the better). There are eight races, each inhabiting a different world across the galaxy. They are engaged in a conflict for supremacy from which only three can emerge. The conflict consists of five rounds. Each round ends with the surrender of one of the eight worlds. 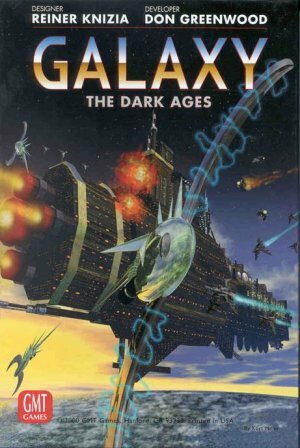 Galaxy, from GMT Games, is an intergalactic combat and conquest card game, brought to you by the same design team (Don Greenwood and Reiner Knizia) that created Avalon Hill's critically acclaimed Titan: The Arena. Galaxy takes players to a whole new venue of intergalactic combat, with the fate of whole worlds hanging in the balance. In Galaxy, the designers provide players with a popular, quick, and highly playable game format, depth of strategy, and wild-and-woolly player interaction in a game that plays to a riotous conclusion in under an hour. In Galaxy, three to five players vie for control of the cosmos with bases and entire fleets of spacecraft. Players build and enhance their game position by establishing bases. Once created, bases are not static; they can be reinforced or damaged by transports or assault craft. Players also control ships with unique capabilities, from the reconnaissance function of the lowly drone to the powerful phasers of the mighty dreadnaughts. Warships can also damage bases which may allow base incursions by other players attempting to master a world. Cards representing Technology Advancements provide windows of opportunity for players to seize the moment and enhance their position with improved screens, phaser banks, warp drives, tractor beams or sensors. When you play Galaxy, the awesome technological powers of the galaxy are at your command. Can you make the most of them? Game play is tense, and each card play is critical, because the most poorly-defended home world is eliminated at the end of each of the game's five rounds of play. Different special powers are wielded by each of the eight races which provide further detail as the deadly game of musical chairs continues. Power-brokering and backstabbing are a staple of the game system; play is dictated by silent alliances and hidden agendas as players bank on their neighbors for support to protect home worlds or vanquish enemy strongholds. Do you have the quick-wits, diplomatic skill, and sheer power to do what it takes to conquer the Galaxy? Or will your less-than-stellar skills provide a gleeful hour of entertainment for your fellow players. Play Galaxy, and find out.